Ever since I first tried this recipe out of Heidi Swanson’s Super Natural Cooking, we eat it at least twice a month, which is saying something in this house where we rarely eat the same meal twice. And while we don’t fight over the leftovers, the spouse who offers to let the other eat the leftovers for lunch the next day certainly gets bonus points. It is, simply, a shockingly tasty recipe. Yes, “shockingly”—look at the ingredients. It’s a recipe for beans and greens. Anyone who’s eaten beans and greens knows basically how they’ll taste, right? Comforting, but kinda bland. Except in this recipe, the pan-frying of the beans means that they end up both crunchy (outside) and creamy (inside). The consistency of the beans becomes somewhat reminiscent of pan-fried potatoes; as you eat, you see why beans can be categorized as a starch. The greens wilt into satisfying chewiness—except for the finely chopped chard stalks, which hold their crunch. Please don’t just take my word for it; you really should try this for yourselves. You won’t regret it, I promise. One note: This does call for beans that you cook yourself—either from fresh or (more likely) dried beans. Canned beans get mashed up too much in this recipe. Since I plan meals by the week, I set aside time the day before we make this meal to prep and boil my beans. I’ve realized that if I remember to plan ahead, cooking dried beans isn’t actually hard or time-consuming; the process takes a while, but the hands-on time is minimal. The quickest way I’ve found to soak beans is to pour lots of boiling water over them and let them sit for 45 minutes. A more ecologically conscious way to soak them is to put them in cold water overnight. I cook them in fresh water at a low boil for 35-40 minutes (depending on bean size)—with a bit of kombu thrown in to help cut down on the gas effect. Then I just toss the beans in the fridge till they’re ready to use in the recipe. Prep your ingredients; the meal will come together quickly. Drain the cooked beans. Heat the butter/oil over med-high heat in a very wide but somewhat deep skillet. Add the beans in a single layer. Stir to coat the beans in oil, and let them sit 3-4 minutes—long enough to get golden-brown on the downward side, before flipping them to cook as long on the other side. Salt to taste, then add the onion and garlic and cook until the onion softens a bit, 2-3 minutes. Stir in the chard, and let cook just until the chard wilts. Remove from the heat, and season with salt, pepper, and olive oil. Serves 3 as a meal. Sally, thanks for stopping by my place and taking the time to comment. I’ve poked around a little here and will be adding you to my list of regular reads! Your journey sounds so interesting and I look forward to learning more about how this is all working for you. Also, this recipe sounds terrific and I think I’ll try it this weekend. I love beans and greens! I do an Indian version of this with fennel seeds, cumin seeds, oregano, asafoetida, chickpeas and tomato. I like the simplicity of yours and I just made a batch of cannelini beans. I will try this! This recipe looks absolutely delicious and I will definitely be giving it a try! Wow, we must be on the same page with beans and greens! I did a similar post a couple weeks ago, but I used squash, cannellini beans, and collard greens and even called it beans and greens. But I do use canned beans on occasion. And whatever I have around. This is one of those “make it up as you go” recipes. Or, use up the CSA veggies recipes. Yes, it’s a good one! [WORDPRESS HASHCASH] The comment’s server IP (72.233.44.55) doesn’t match the comment’s URL host IP (74.200.243.251) and so is spam. I’m eating beans and greens as we speak–kale and northern beans. You’re right–comforting, but a wee bit boring! It’ s the perfect time of year for a recipe like this. For some reason I initially read “beans and grapes” – and now I am wondering how that would taste! YUM!!!! I love greens and beans! I’m totally making this. yum! i love chard! i just made some with chickpeas the other night as well… i love how it’s so simple to make yet so flavorful. thanks for the tips on cooking dried beans too– i hadn’t heard of kombu! perfect timing. i had chard and was on the way to the grocery for a pumpkin to entice the kiddos to come by, so i got beans. i’m giving it a spin tonight. Sally – this looks great. I’m always on the lookout for more ways to get greens into my diet. Thanks for the suggestion. I admit, I made this without reading the directions thoroughly and I used what I had onhand (which was a couple cans of organic beans). I could’ve easily made a pot of beans if I had planned ahead, but I didn’t. However, I think it’s still tasty, even though the beans didn’t really hold their form. I messed with the flavors a bit and added curry, cumin and cinnamon. The beans broke down, almost to the point of becoming a sauce in and of itself. It wasn’t anywhere near as pretty as your dish looks (with the whole beans) and obviously the crunchy/creamy texture was lost, but it was still really great. I’ll try it again with from-scratch beans. Hint for from-scratch beans: If you slightly under-cook them (or under-soak them if you’re doing it overnight) you can freeze them until needed. Not as environmentally friendly as soaking then using, but it does give very very cheap ready-to-use beans! Thanks for this neat recipe, I have to see if my current diet allows any of those huge type beans (I’m on an anti-migraine-trigger diet and I know it disallows some beans but allows others) because I’m craving this now. Love your blog, that’s great about losing all that weight, I lost 75 lbs since I was diagnosed with food allergies, check out my blog, free of the major 8 allergens + gluten. I look forward to following your story. 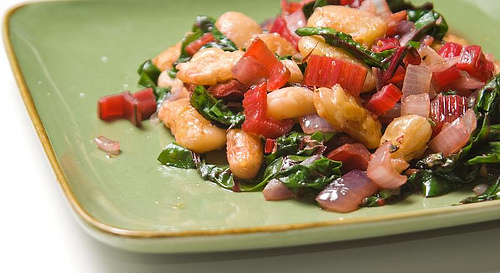 I just tried this–though I had to substitute chickpeas for the white beans and kale for the chard–and it was utterly delicious. I’m impressed that your third serving makes it to lunch the next day–my husband took care of ours already . . . I made this recipe and it is delicious especially with the fresh chard from my garden. I “kick it up a notch” by adding some of my home canned pineapple salsa. So good!! !